The Android software development kit (SDK) includes different components, including SDK Tools, Build Tools, and Platform Tools. The SDK Tools primarily includes the stock Android emulator, hierarchy viewer, SDK manager, and ProGuard. The Build Tools primarily include aapt (Android packaging tool to create .APK), dx (Android tool that converts .java files to .dex files). Platform Tools include the Android debug shell, sqlite3 and Systrace. The Android SDK can be installed automatically using the latest version of Gradle or downloading the Android SDK manually in several different ways. Below is an overview of all different approaches. Gradle 2.2.0 now supports downloading automatically dependencies. Make sure to upgrade to the latest Gradle version. The Gradle plugin to manage dependencies is now deprecated. Assuming you have macOS/OS X running, you can use Homebrew to install the Android SDK. You will need to download the Android SDK without Android Studio bundled. 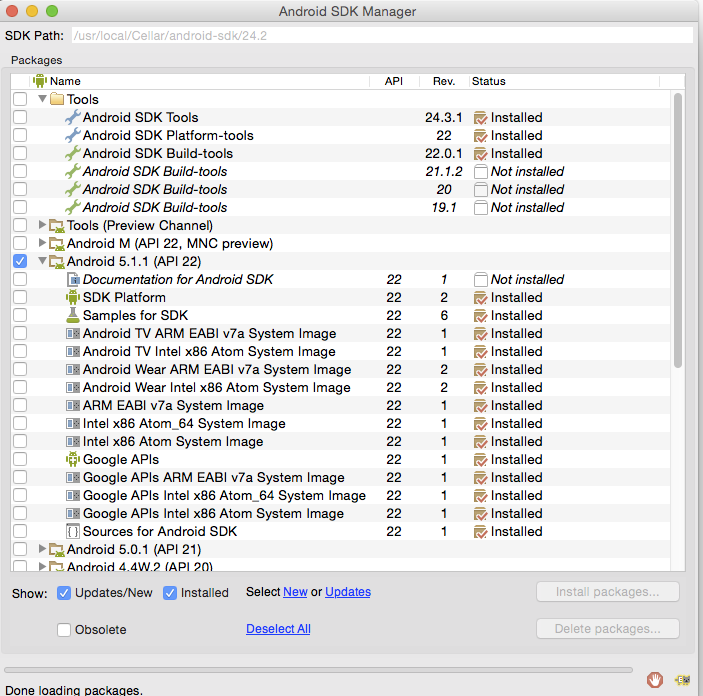 Go to Android SDK and navigate to the SDK Tools Only section. Copy the URL for the download that's appropriate for your build machine OS. Unzip and place the contents within your home directory. The directory names can be anything you like, but save the files in somewhere easy to find (i.e. ~/android-sdk). $ tools/bin/sdkmanager "platforms;android-25" "build-tools;25.0.2" "extras;google;m2repository" "extras;android;m2repository"
Now it's time to set your build environment's PATH variable and other variables that will be use to locate Android. Edit your .bash_profile file. If you're not using bash, edit the right config file for your environment. At the prompt, type android and hit Enter to launch the Android SDK Manager in a window. If this doesn't work, your PATH variable has not been set up with the Android SDK location. You will want to install the same Android SDK packages on your build machine as you did to get Gradle running locally. Before you begin, take a look at the build.gradle file in your project. One version of the Android Platform. E.g., Android 5.1.1 (API 22). It should be the one you named in the android: compileSdkVersion section of your build.gradle file. then make sure to download that API version in the Android SDK Manager. You can also download the SDK packages using the command line with the --no-ui parameter. If you decide to be selective about which packages to be installed, make sure to include the extra Android Maven repository. Otherwise, you may not be able to use the latest support design library. There is currently no filter to install the build tools directly. See this ticket for more information.